I am a retired English prof near SanAntonio and after I retired I repped a major builder for a while before actually building some tiny houses. Several were built with the bedroom on the lower floor and they worked out nicely for their owners. We no longer build, but currently have a custom built Escape Vista for sale if anyone is interested. See me (Mike) via www.bella-green.com. Thanks. The good thing about the Tiny House is that people can make their tiny house what they want or what they thoughts. Here are my thoughts before we build a tiny house. In terms of small space utilization, we chose to minimize sleeping space. I thought Loft was the best, and I still think that. I chose stairs that can be used as storage space. What I realized during 15 months of living in a tiny house here. I did well not to install the bedroom on the main floor. Why? I made my living space more spacious. When I was sitting on the couch or sitting in the dining area to eat, the living space was so wide that the tiny house didn't feel small or frustrating at all and felt rather spacious. because most of the time we spent in this living room(great room) area. Another advantage is the winter season. When I turn on the gas heater, the Loft area warms up quickly. Before going to bed, turn off the heater and go up to the loft and I feel warm and cozy every time. Of course, if I come down to the main floor, it is chilly. So I turned on the electric heater in the bathroom for business in the middle of the night. The electric heater is set to operate at a certain temperature. Every person has different ideas and different lifestyles. I am only picked loft of small height according to my lifestyle. I hope you find your way. I would go with a bed with storage underneath since storage is so important. There is so much room under a full size and even more under a queen size bed. Do you ever get rocked around too much in your houseboat? I've always wondered how that would be. Not too badly, Gary. If it's very windy the boat will be pushed from one side to the other in the dock slip, so the key is to have it secured by lines on both sides which reduces the movement, but there's no way to eliminate all movement. But honestly that's what I love about living on a boat. I love the water & love the sway of the boat in the water. Hi; I am new to this Tiny House Forum but have loved small houses all my life! I grew up in a two room house with my Dad; Grandma and two sisters. Daddy slept in the attic and the rest of us in the bedroom. The only other room was the kitchen big enough for a couch, rocking chair, a few cupboards, sink, small fridg , kitchen table and five chairs ! The house was about 12 ft. x 24 ft. total. As life goes sometimes; things changed as an adult with kids of my own; so no more tiny houses for many years. In 2017 we retired from farming full time and sold our big old farm house with some land. We kept five acres and our 10x12ft wood shed which is now a cabin with an added 8ftx12ft sun-porch. Since we have to comply with building code laws here we are not allowed to build another structure on our land as it is classified as resource/ farm land. Re-zoning to residential would be expensive and defeat our purpose of living off-grid since we would be required to install a septic system and need electricity.. Presently we are allowed to camp on our land and farm it. We grow all our own vegetables and have several varieties of berries. The sun-porch is used for drying beans. There is a 10x12 basement for storing vegetables and some gardening tools. 10x12 ft is a bit crowed for two people to live in full time so our only other option is to add a Tiny House on wheels. All is fine with the building code as long as there are wheels to move the house or trailer. In the cabin I have a corner with a wooden kitchen utility cart that has a cupboard space, four drawers and granite top. There is also a pantry cupboard, a tiny wood stove in another corner, small folding table and a 3/4 bed against the remaining wall. . A wooden rocking chair completes the furnishings in the cabin. It has to be moved and shifted out of the way. If we stay there we need to add a travel trailer or Tiny House for additional room. Travel trailers are low on construction and don't stand up good in a windy , cold climate. So adding a Tiny House makes more sense. 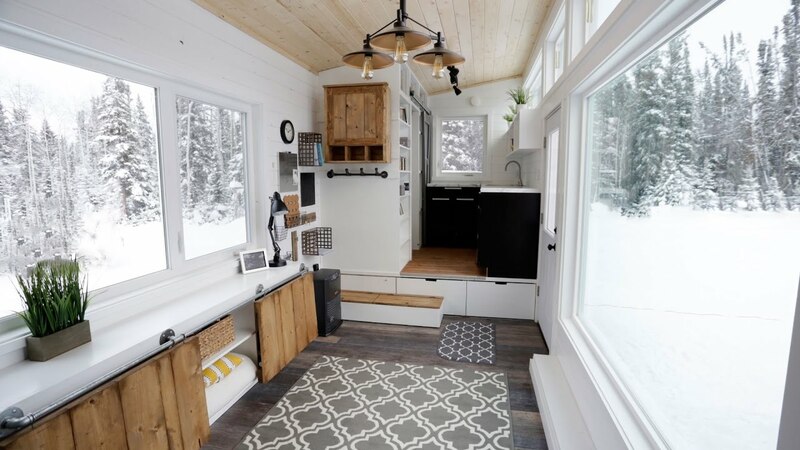 What I am wondering is what is more practical; to add a Tiny house used only as bedroom and storage or to use it as the kitchen area and storage? In a sense the Tiny house will be adding an extra room to the cabin BUT CAN NOT be physically attached to the cabin. Any suggestions would be appreciated. Im new to the forum as well, just joined a few minutes ago an here I am already puttin in my 2 cents! Of course, I can't really give a valid suggestion knowing so little about the site, its location and orientation etc. but....judging only from your description of your current layout, I can't help but to making a few suggestions. It seems that the most "thrifty" option might be to keep your current layout intact, as long as it works well for you, and put you time and money into the tiny house addition. One of the good things about small homes is that you can use high quality materials at a fraction of the overall cost of a typical luxury home. So, I say keep it simple and make it nice...use the best materials you can afford and you'll end up with a tiny portion of a $1,000,000 pad. Again, not knowing all the details, I suggest that the tiny house be kept as open as possible to present a feeling of spaciousness, with the majority of the space dedicated to a living/sleeping/studio space with , perhaps, storage area at one end and a small bathroom at the other end with a quality composting toilet and a grey-water shower, and if it's in the budget, a vacuum tube solar water heater on the roof. Keeping it as open as possible will also enable you to convert it to a full tiny house by adding a kitchen area and sleeping area (loft). Depending on how close you're able to put the tiny home to your main structure, you could connect the two by extending the deck to create a continuous out door living space between the two with perhaps, open arbors that can be covered for weather or security needs. I'm a big believer in using decks as inexpensive extension of living area, especially in relation to small homes, and, unless they are permanently covered, don't show up on the books as floor area. That looks like a MitchCraft Tiny Home build! That's who built mine and I have the same bedroom over the gooseneck. It's my teenage son's bedroom. He has a full-size platform bed with storage underneath and a 4' desk. I sleep in the short loft on the other side of the house, which is fine for me. But my kiddo absolutely loves his room and the fact that he has room to stand. Hey, everyone. I've been following this discussion and it seems like a lot of people have an issue with getting in and out of a tiny house loft and I can certainly relate. One of the members of our community, Joe happened to respond to a post from another member asking for information about tiny houses for seniors or disabled people in this post, So many questions... 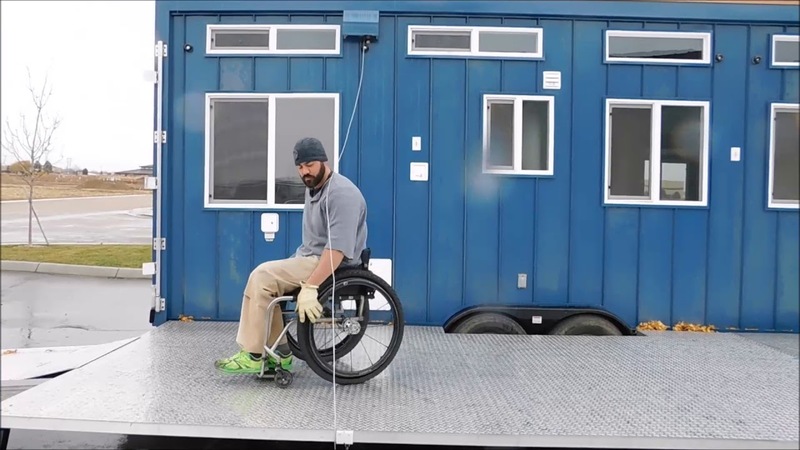 In response to the question, Joe posted a video of a tiny house designed specifically for a disabled gentleman. One of the features of this tiny house is an "elevator bed" which I can see as a resolution to the loft issue for anyone, disabled or not. I thought I'd go ahead and repost the video here as it's relevant to this discussion. It's a 9 minute video but if you don't have time to watch the entire thing the portion related to the "elevator bed" is only 40 seconds and begins at 3:00 and ends at 3:40. This just seems like the perfect solution to dealing with the loft issues discussed here. Hi Heather, I still have the brochure from the event and you're right! It is a MitchCraft model. I wasn't sure how to describe it to everyone because the bedroom wasn't on the main floor but it also wasn't a loft. I called it a split level tiny house, lol. But yes, the bedroom was over the gooseneck and it was amazing! You're so lucky to have a layout like that and honestly an incredibly beautiful home overall. Thanks for sharing the pics. That bedroom looks huge with a full size bed and that is a ton of storage underneath. I love how you've made great use of the space with the desk too. Love the lighting fixtures and beautiful window. I'll stop now but I really do love your setup! haha. One question, why are you letting your son stay in the big room! That's a grownups bedroom. lol. 😉 Maybe there's a reason I'm not a parent. I would be horrible. Ana White built a tiny house in Alaska and she has a bunch of clever storage solutions in it. The bed portion starts at about the 3 minute mark in this video. He's a teenager and needs his own private space. He spends 75% of his time in there hanging out, doing homework, art, etc. Even after he moves out I don't think I'll move my bedroom into there. I will probably use it as a studio. I only use my bedroom for sleeping and I don't mind being in the cozy, short loft. It's tall enough that I don't hit my head and it's easy enough for me to crawl in and out of. Holy Moly!!! Those tiny house pictures are really great. What a nice little space you got there! Thank you! My builder did an amazing job. I really am in love with my little home. Hi; Thanks for your suggestion. We wanted to build a room on but because our land is resource/farm land we are not allowed to build anymore permanent structures with out rezoning which engages a lot of building code issues we don't wish to deal with. Our only option is a structure on wheels or live somewhere else part time. Our cabin was a former wood shed which we moved before we subdivided the farm and sold part. It was done legally and is with in the municipal laws. The cabin and sunporch are 216 sq. ft and what we were allowed to have. They were very specific we can't go bigger without rezoning and putting in a well and septic. What we have done now is purchased an old 1970's mobile home with an acre of land. It is 12ft x 45 ft with a kitchen living room area bathroom and two bedrooms ; one of which is more like a closet! It is a mile from the farm so we decided to live in the house trailer on a main road winters and the rest of the year camp in our cabin on the farm land which is down a lane from a dirt road. The mobile has a partial basement and meets all building code requirements. We bought it cheap and had to replace the wooden roof, rewire and fix the plumbing in order to live in it. We cleaned up an awful mess of trash and three years worth of overgrown grass but at least now we are legal within the by-laws and get on with living again and planting our gardens at the farm. The mobile is still quite small and suits us. If we were younger we wouldn't mind camping in the winter too but now my husband is 74 yrs and me 72 yr winter will be easier in the trailer and we can still enjoy the farm three seasons of the year. Life gets a little more complicated as one ages but still can be enjoyed. Have a nice day.